Subway says it will be discontinuing use of a chemical found not only in its bread, but also in yoga mats, shoe soles and rubber caps after an online petition made waves across the web. Food blogger Vani Hari — who successfully petitioned Kraft to remove the neon orange dye responsible for its signature Macaroni & Cheese colouring last year— is behind the effort. With more than 50,000 signatures, her petition demanding that Subway stop using azodicarbonamide as a food additive helped convince the food chain giant to comply. The chemical agent has already been banned across Europe, as well as in Britain and Australia and while Hari says Subway does not include the additive in those countries, it’s still used in sandwiches distributed across North America. Subway said it is already in the process of phasing out the chemical’s use in its products in the U.S. and Canada. “The complete conversion to have this product out of the bread will be done soon,” the food chain said in a statement Wednesday to the Associated Press. A timeline hasn’t yet been provided. 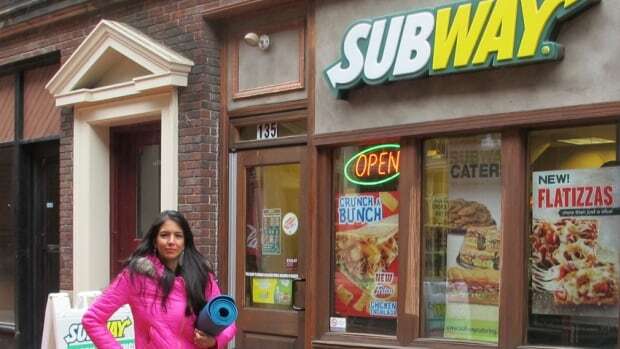 Hari said that while this isn’t the first time she has tried to reach out to Subway regarding its use of the chemical, she commends the company on its decision. “Their swift action is a testament to what power petitions can have,” she said, adding that she would still warn consumers to stay away from their sandwiches until the chemical’s use is removed. The Charlotte, N.C. blogger started investigating Subway sandwich ingredients on her popular blog, FoodBabe.com in 2012, when she discovered the company’s use of azodicarbonamide. “I had been eating Subway my whole life, thinking it was healthy fast food until I found out that it’s not eating ‘fresh’ at all,” Hari said, playing on the food chain giant’s “Eat Fresh” slogan. The food blogger’s decision to petition Subway was made as soon as she learned that the U.S. president’s wife, Michelle Obama, would be teaming up with Subway to promote its sandwiches in a campaign marketing healthy foods to children. “The bottom line is that they save more money using this ingredient because they can produce the bread faster and cheaper,” the food blogger added. The petition has since reached more than 65,000 signatures.